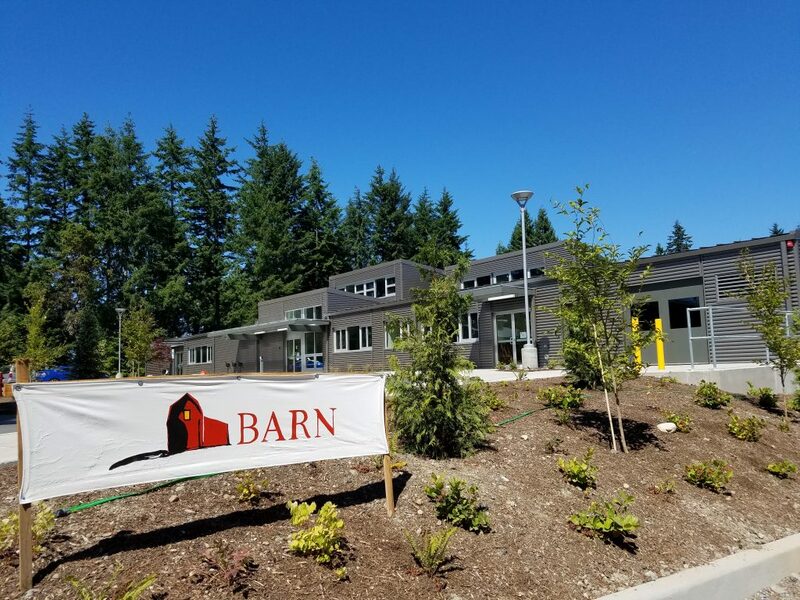 I recently visited the newly opened BARN facility at 8890 Three Tree Lane, Bainbridge Island, and was very impressed. 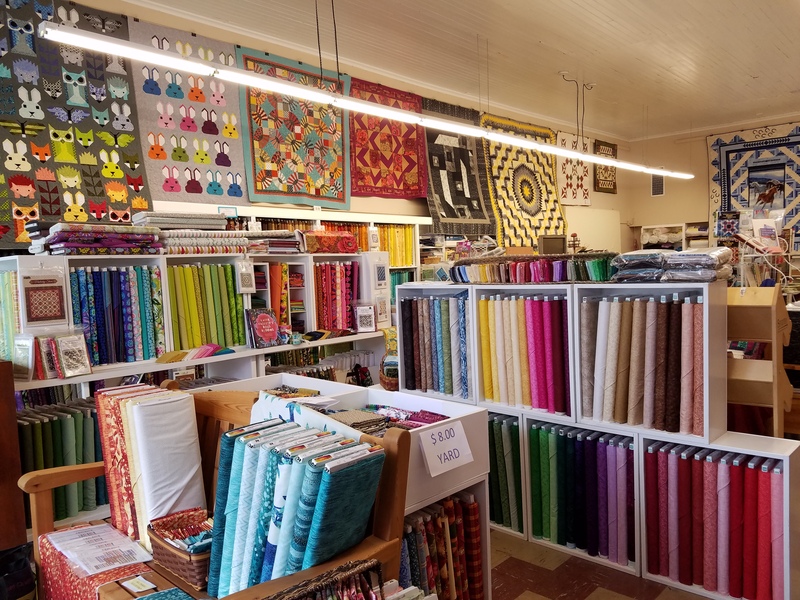 BARN’s mission is to build and support an open, inter-generational community of artisans and makers who are dedicated to learning, teaching, sharing, and inspiring each other with creativity, craftsmanship and community service. 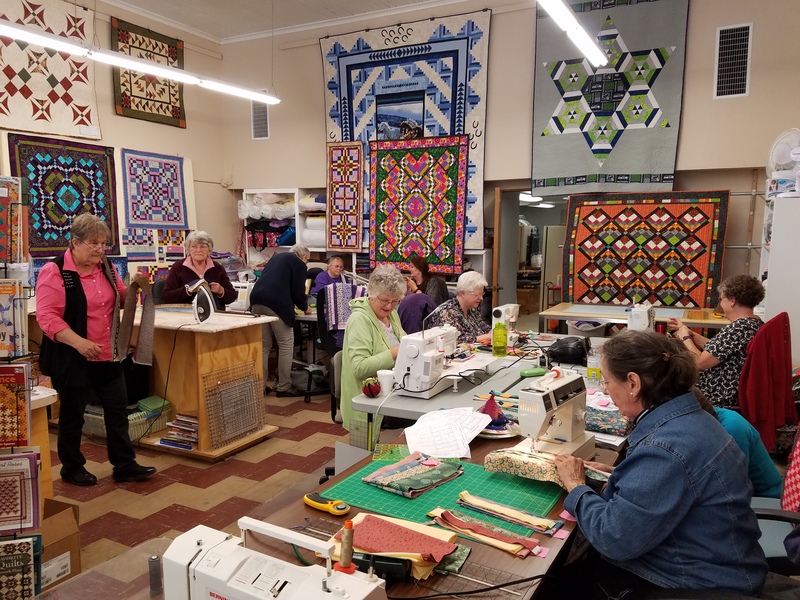 Their goal is to create a true community center, using craft as a magnet to bring together people who would not normally know one another or have opportunities to collaborate. They want to connect seniors eager to pass on skills they spent decades learning with young people just starting out, and longtime islanders with people who have just moved here. Working side-by-side, participants will share tips, ask questions, and lend a hand when needed, gradually building trust and new friendships. 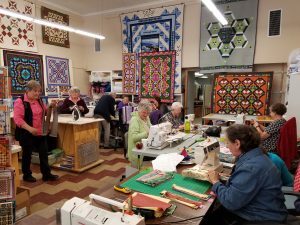 Community service projects done in BARN’s workshops will widen the circle of connections even more. The result will be a more resilient community—one where people have hands-on skills and are committed to helping one another. Years of planning and fundraising went into BARN. The project was initiated by a group of woodworkers who wanted to share studio space, tools and expertise. The woodworkers have spent hundreds of hours making all the cabinets, tables and more. 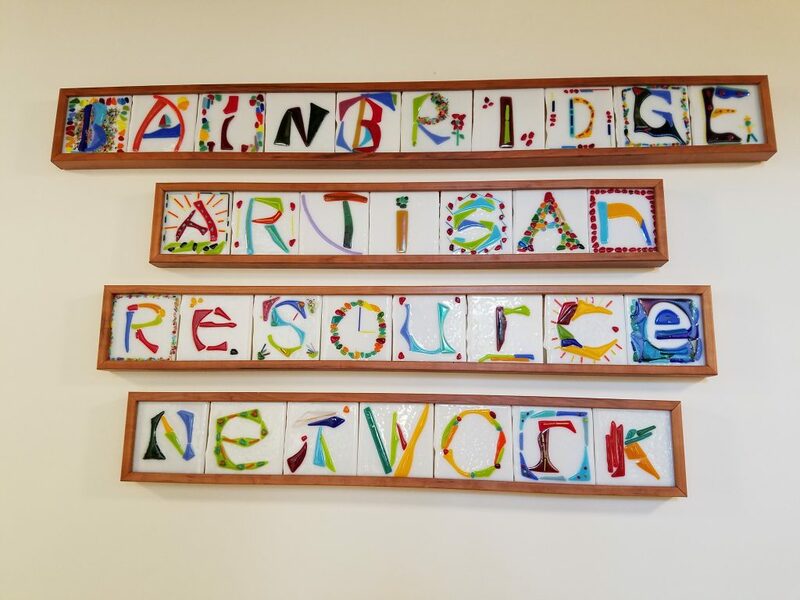 BARN has 25,000 square feet of space including 11 studios: Woodworking and Boat Building, Metalwork, Welding and Sheet Metal, Jewelry and Fine Metals, Glass Arts, Fiber Arts, Printmaking, Book Art, Writers, Kitchen Arts, and Electronic and Technical Arts. Members may use the studio space and the equipment. 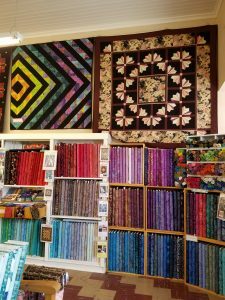 Classes are open to members and non-members and various organizations, such as the Bainbridge Island Modern Quilt Guild, can meet there. This is an awesome place! 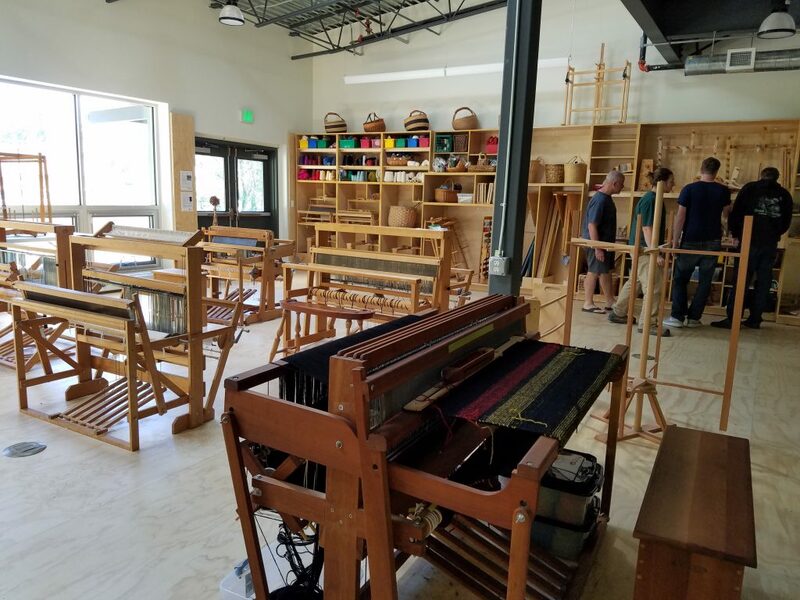 Here’s a picture of the Textile Arts studio, mostly focused on weaving with several looms available for use. 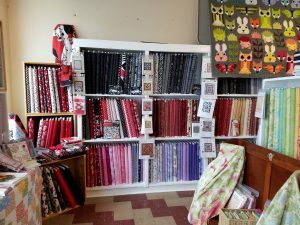 There are one or two sewing machines, but so far, the space is not really set up for quilters and there is no work wall. 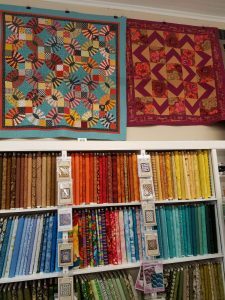 It’s early days and quilting is not currently a priority, but who knows, one day they might get a long-arm sewing machine. My good friend and long-arm machine quilter, Wanda Rains, recently completed this delightful elephant quilt. 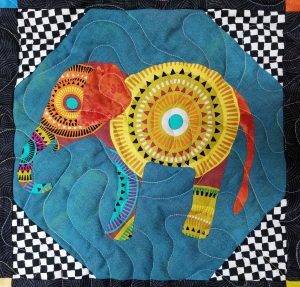 This appliqué pattern is by Edyta Sitar, Laundry Basket Quilts. Wanda hand-appliquéd the elephants and just for fun, turned one elephant facing the opposite way from all of the others. Check out these detailed shots of some of the elephants. I love Wanda’s choice of fabrics and all the elephants have eyes. 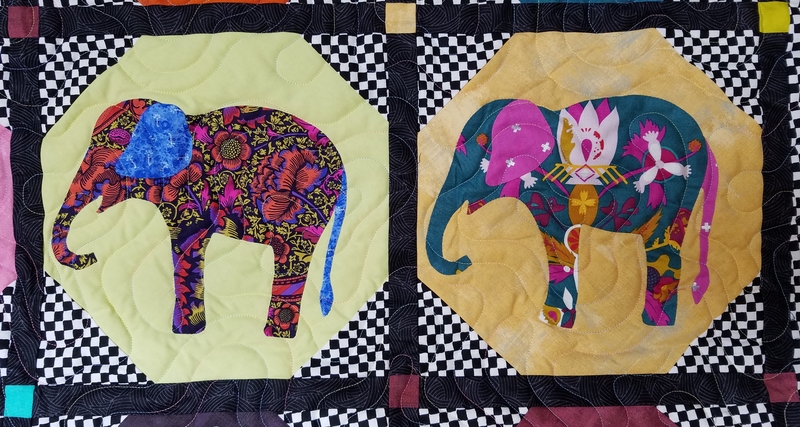 The checked corners in the blocks and border and the dark sashing strips make a pleasing setting for this herd. I’ve recently completed a quilt that I’ve been working on for a few months, just in time to take it to Italy to give as a gift for dear friends who moved there in April. 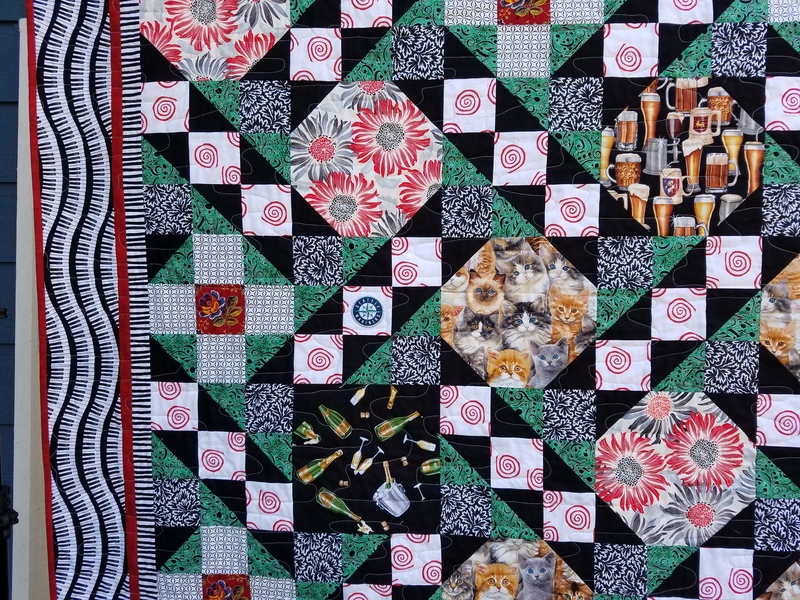 I’m so excited about going to visit them and the quilt is a surprise. By the time this blog posts, I will be in Italy. 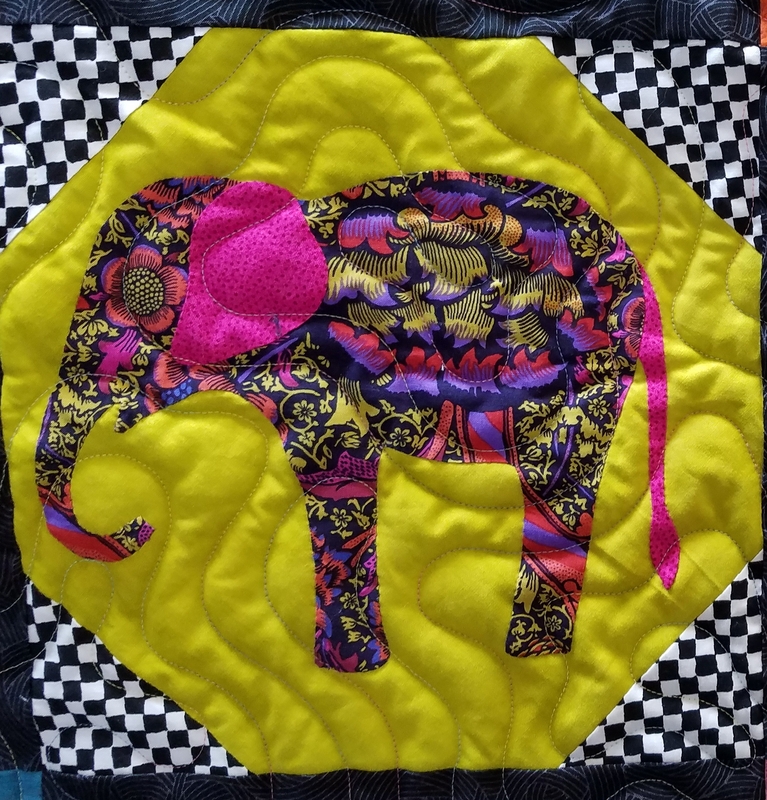 This busy design includes very personalized fabric choices. 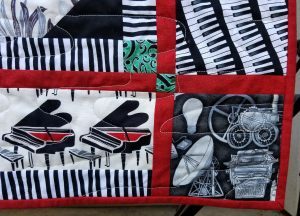 Anne is an accomplished musician and Denise is an electrical engineer. There’s beer for Denise and prosecco for Anne. 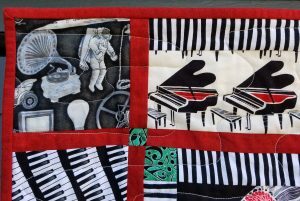 The grand pianos and piano keys are a major feature along with the flowers for these avid gardeners. The large flowers are the new ones in Italy, (Anne and Denise and the flowers they will plant) and the small classical flowers are the Italian ones. Here’s a closer shot for more details. They love cats and have one which traveled with them from US to Italy. 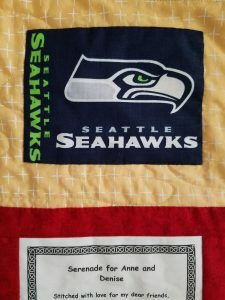 After completing the quilt, I realized that I omitted any reference to their sporting allegiances, so I added the Seattle Mariners compass, appliqued on and visible close to the center of this picture. 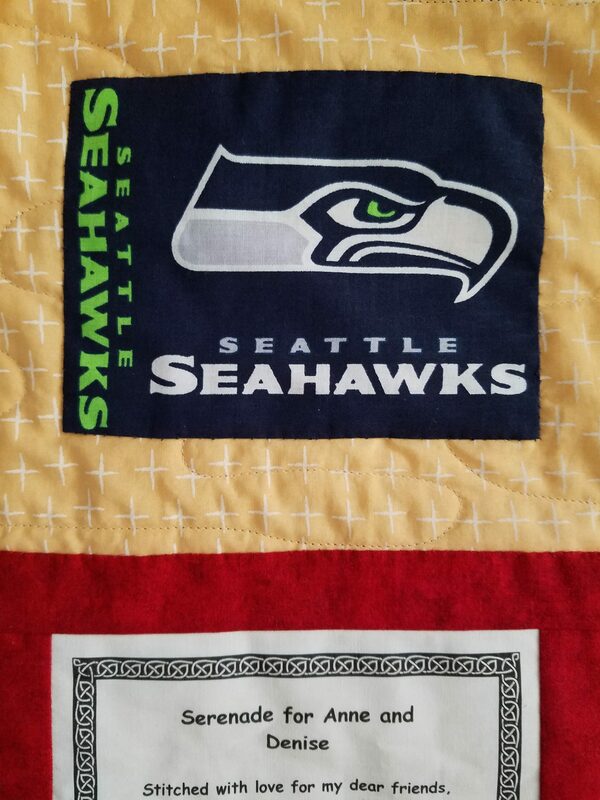 The Seattle Seahawks label appears on the back of the quilt (see below). 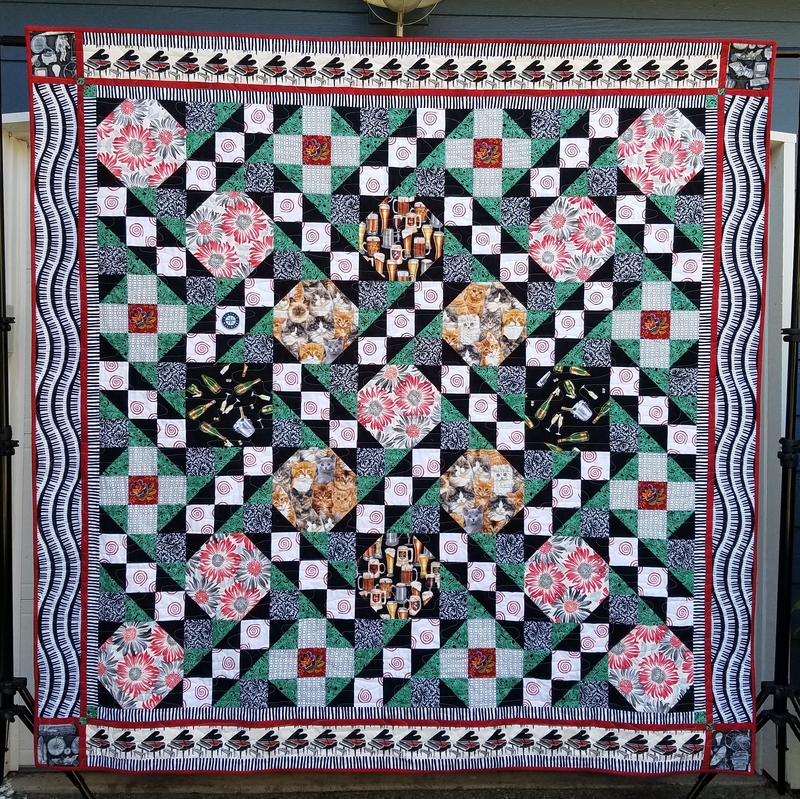 In this picture it is a little easier to see the three different blocks in the quilt: Snowball, Jacob’s Ladder and Shoo-fly. 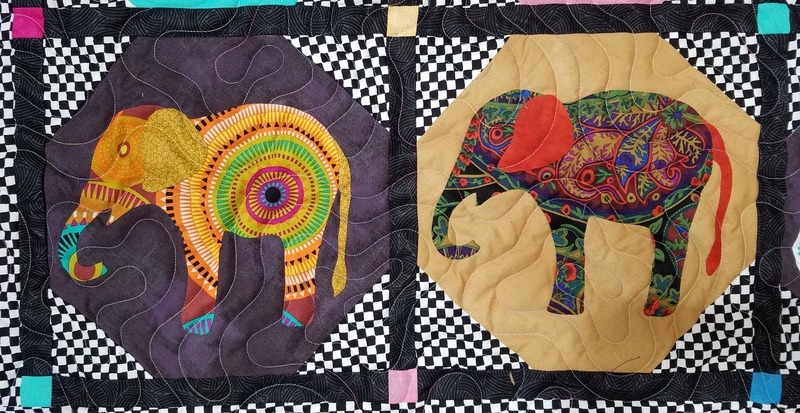 The detailed shots below show the corner blocks in which I used technology fabric for Denise. 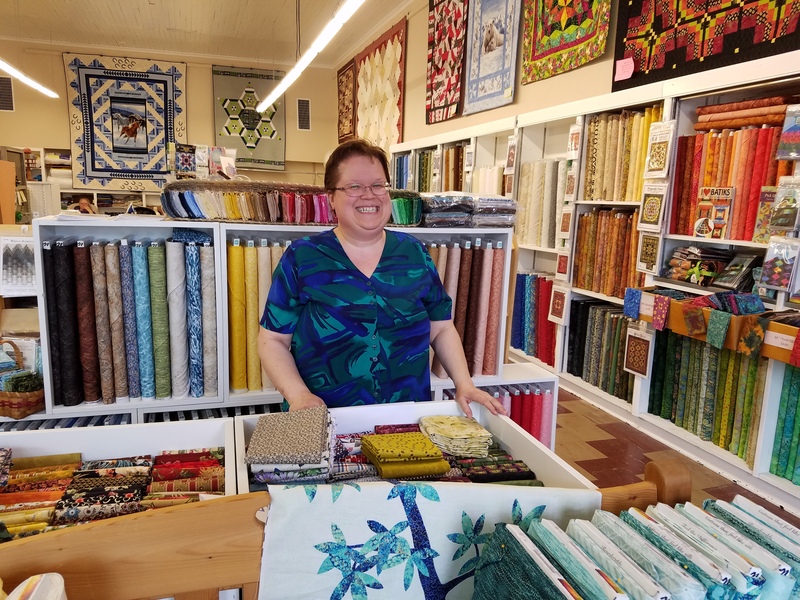 Denise generously gave many hours of her time to completing all kinds of technical projects at our church, St. Barnabas Episcopal Church on Bainbridge Island. 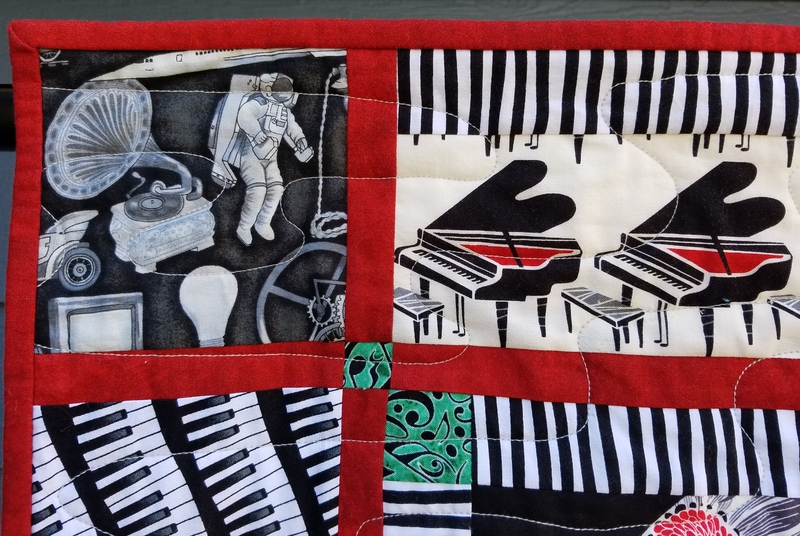 She made tremendous improvements to the lighting, so the fabric with light bulbs seemed most appropriate. The shots also nicely illustrate the grand pianos. 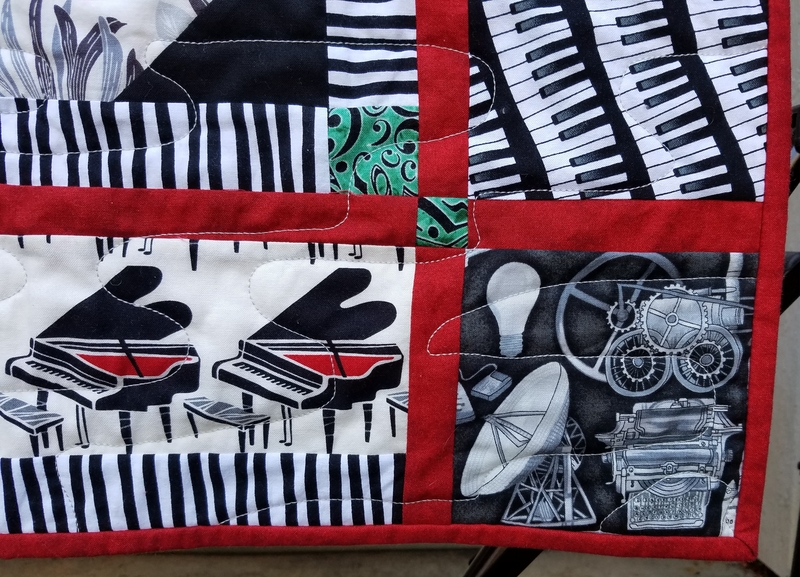 One of my students brought some of this grand piano fabric to my Bargello Quilts with a Twist workshop and fussy-cut the pianos for her blocks. 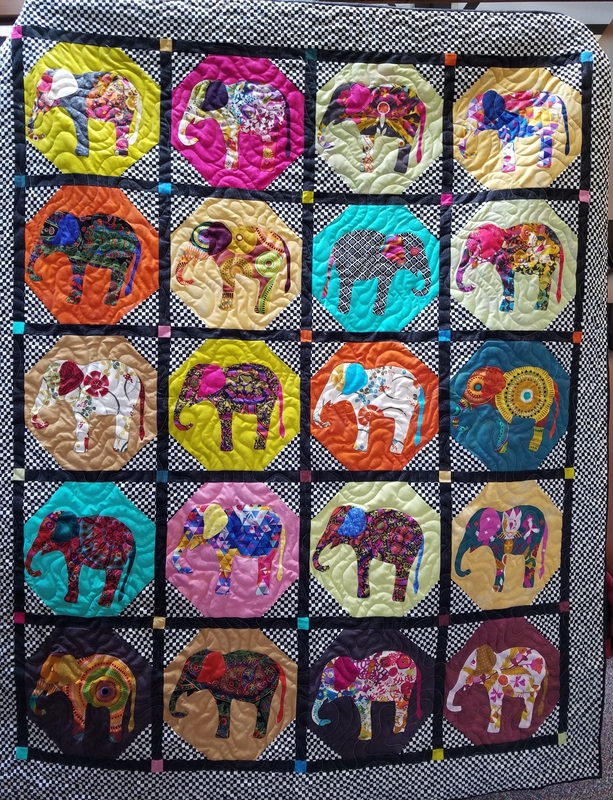 They looked great and I loved the fabric, so I found it on-line and ordered it for this quilt. 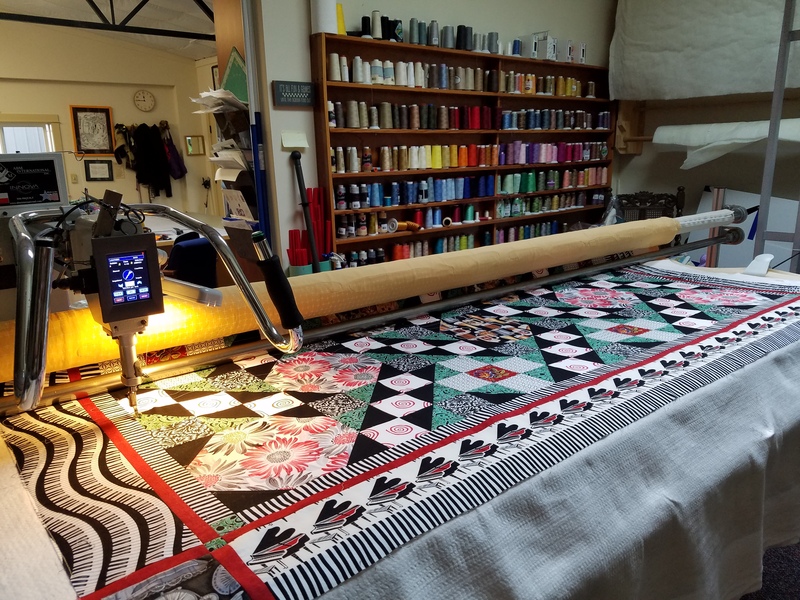 I long-arm machine quilted the quilt with the help of my good friend Wanda Rains, using her long-arm machine. Wanda helped me with the set-up on the machine and advancing the quilt after each pass of stitching. 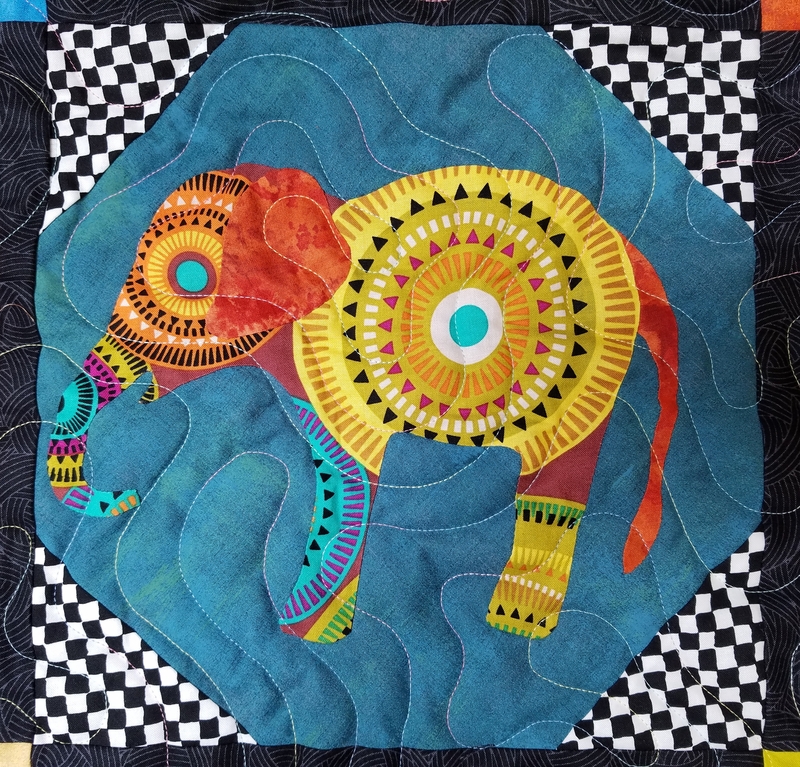 I quilted in a watery meander pattern. The back of the quilt is yellow and sunny; sunshine and water to nurture these new flowers in Italy. 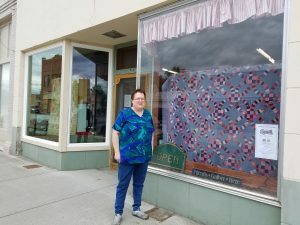 In May, on my way to the John Day quilt show, I spent a day teaching at Highland Quilts in Athena. 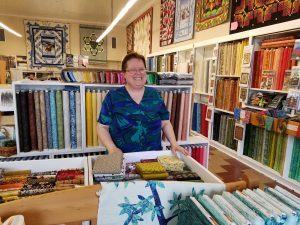 I met the owner, Elaine Shaw, when I taught last year in Walla Walla. She was enthusiastic about my work and asked me to contact her anytime I was visiting the area. Athena is a tiny rural farming town between Walla Walla and Pendleton. Elaine’s shop is at 312 East Main Street, (pretty much the only street), and well worth the small detour off the highway if you are passing. Here’s Elaine outside the store and inside. 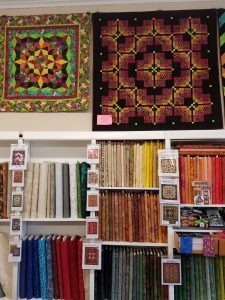 We had a cozy class of 10 students at the back of the store for my Bargello Quilts with a Twist workshop. 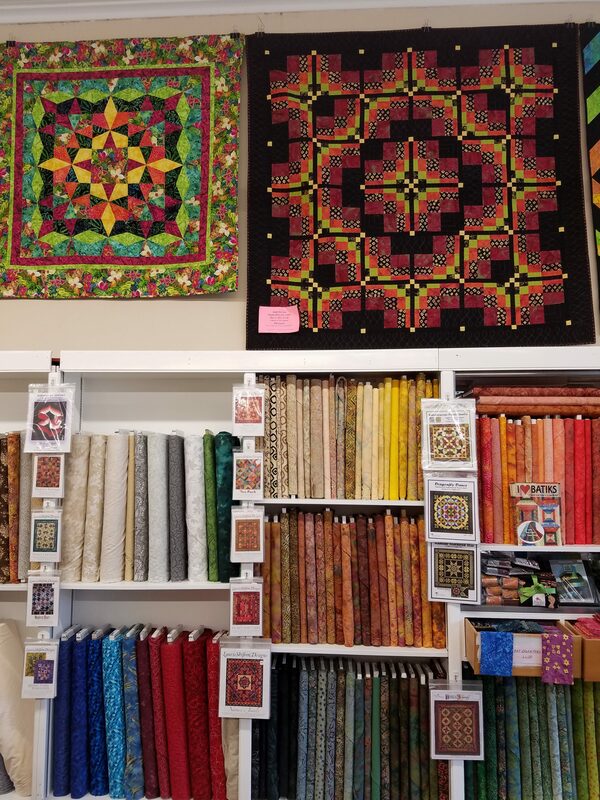 Elaine had made a beautiful sample for the class, which was hanging in the store, along with the quilt she began at my Kaleidoscope Puzzle Quilts workshop last spring. 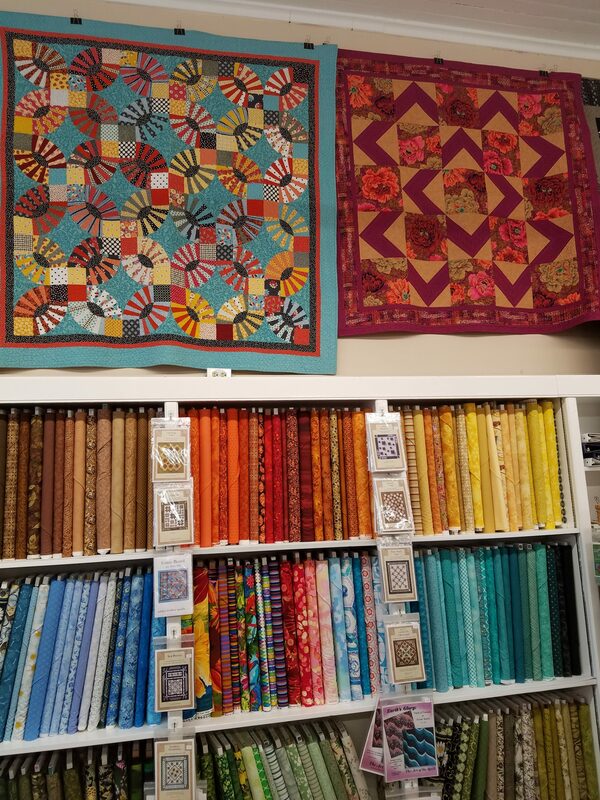 These samples really make a difference in promoting my books and patterns in the store. The store is one large room with a good inventory of fabric as well as the essential notions, books and patterns. 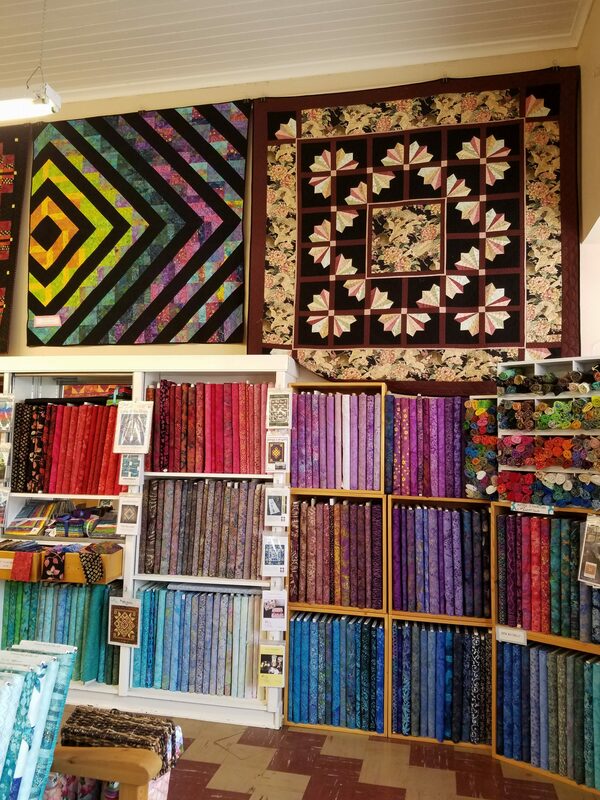 The upper walls are lined with beautiful colorful quilts to inspire. Elaine will give you a warm welcome and you should enjoy this gem. Happy 4th of July! One of my students in Texas brought this fabric to class. 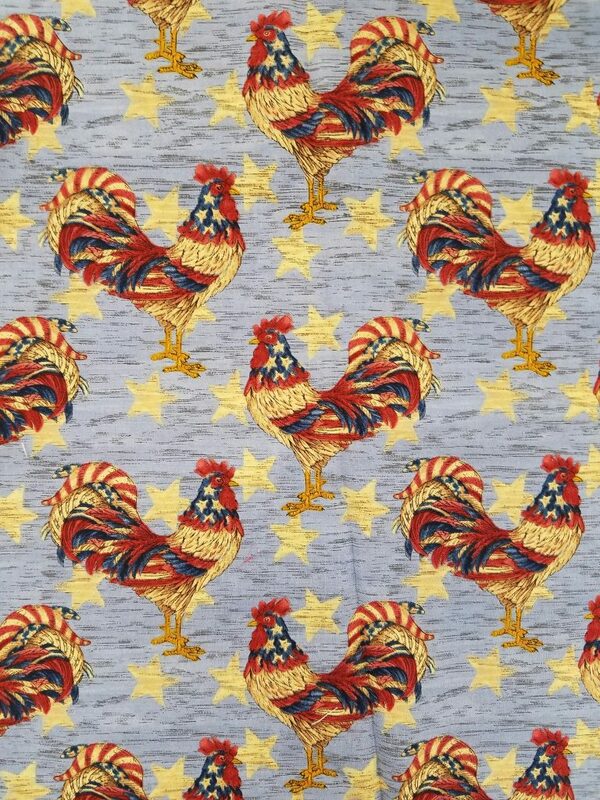 I just had to smile when I saw these patriotic chickens!